More than 150 business, community, and opinon leaders participated in the BizFed Institute’s NextUp Forum: Clean Water for Life and Business at Woodbury University in Burbank on June 4, 2014. This major half-day educational event brought together top academic, government, industry, and environmental experts to address the opportunities and challenges associated with securing safe, reliable sources of clean water to sustain life and business in Southern California. As a public service, with grateful support from the Metropolitan Water District of Southern California and the Los Angeles County Department of Public Works, we have produced this electronic document as a one-stop resource highlighting critical intelligence resulting from those proceedings. By bringing together diverse – and even conflicting – voices, our goal is to move beyond rhetoric and contribute to informed decision making about California’s water resources. What specific mix of resources can we rely on (e.g., imported, recycled, local groundwater, and conservation), taking into account cost, regulatory hurdles, public acceptance, potential drought, climate change, and environmental restrictions on existing and planned water supply sources? What specific near term decisions need to be made by the City of Los Angeles, other local water suppliers, the Metropolitan Water District of Southern California, the State of California, and the Federal Government in order for your vision of water supply reliability for Southern California to be realized? How do you propose the water supplies in your vision of water supply reliability be paid for, and what would be the water and property tax rate impacts in the Los Angeles County area? Jim McDaniel, Senior Assistant General Manager – Water System, City of Los Angeles Department of Water and Power, who oversees all water system operations at LADWP, including production, distribution, treatment, pumping, water resources, and engineering for the largest municpal utility in the United States serving more than 4 million customers. McDaniel said it will take appropriate planning, management, and investment in order for the region to have enough water in the future. Additionally, Pestrella noted that California needs federal dollars to help solve water woes. Additionally, Antos urged us to reframe the conversation about costs, arguing that money is being spent on landscaping and streets and other infrastructure that causes, rather than alleviates water problems. Deven Upadhyay, Group Manager, Water Resources Management, Metropolitan Water District of Southern California, who manages water resources, including conservation efforts and groundwater recovery, said unfettered water demands on a per capita basis cannot continue. Additionally, Upadhyay argued that the Bay Delta needs to be shored up before a crisis, such as an earthquake, diminishes Southern California’s water supply. 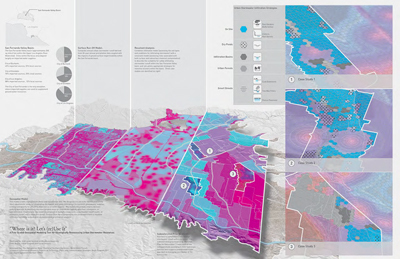 Peter and Hadley Arnold of Woodbury University’s Arid Lands Institute, presented Hazel, a dynamic, integrated planning tool for water-smart urban development in drylands. The Arnolds are national experts in analytic modeling and visualization of stream systems in arid rural environments; the analysis of embedded energy within imported urban water supplies; and the quantification of storm water as groundwater augmentation supply. Click here to download their full presentation. 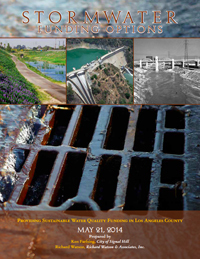 Describes the stormwater regulatory requirements specific to the greater Los Angeles area, the complexities of funding stormwater programs, and the Los Angeles County Flood Control District’s funding initiative. Recommends a “multi-pronged” approach to address urban runoff funding issues, since our communities may encounter several dead-ends. A number of the recommendations require active management and a higher degree of organization by local government. The recommended actions are voluntary, and the report is not advocating that any city, group of cities, or the County adopt stormwater fees. Click here to download the full report. Stormwater Funding Options, by Ken Farfsing, City of Signal Hill, and Richard Watson, Richard Watson & Associates, Inc.